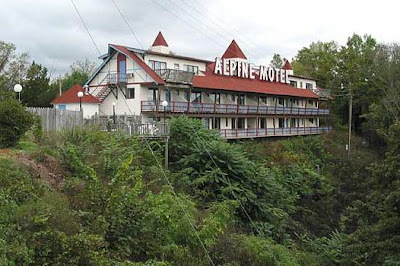 The Alpine Motel sits on Big Hill Mountain (this is Cumberland County, not the Big Hill Mountain in Madison County) looking down on Burkesville. The motel itself is an interesting sight, with its vaguely neo-Swiss architecture and design, and part of its view is also historic: it overlooks the site of the first-ever oil well in America. 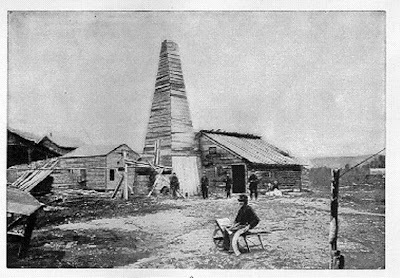 Funnily enough, the oil was struck by accident in 1829 - they were actually drilling for salt and were disappointed to get oil instead. Eventually they started to collect the gushing oil, but they still weren't getting the point - they botted it and sold it as a medicine-show elixir called "American Medicinal Rock Oil", claiming it to be a cure-all.